It seems there have been some misunderstandings surrounding the departure of Ali from the band. friend Ali was a part of them when we were on tour. As we enter into a new chapter and record for the band, we can’t wait to share all of the new songs Bobb and I are working really hard on with all of you. Thank you to all of our fans for supporting us. We are looking forward to experiencing our second record with you soon! “Best Coast drummer Ali Koehler Tweeted yesterday that she is no longer in the band, as Brooklyn Vegan reports. 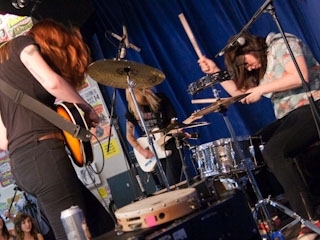 Koehler left Vivian Girls last year to join Best Coast. When asked why she left, Koehler Tweeted, “Not my choice, sorry if you’re disappointed”, “I’m sorry, I’m equally disappointed”, and “your guess is as good as mine”. “The local noise-rock darlings have launched a constellation of prominent satellites.